Background: As episodes of decreased oxygenation levels have been recorded in premature infants placed in car seats, it is believed that these infants are at risk of life-threatening events and death. No data on the prevalence of such infant deaths are available. The aim of our study was to determine the incidence of sudden deaths in infants occurring in sitting devices in a whole population and to determine whether premature infants account for a disproportionate number of these deaths. Design: Retrospective population-based cohort study reviewing all cases of sudden unexpected death in infants between birth and 1 year of age that occurred in the province of Quebec between January 1991 and December 2000. Results: Of the 508 deaths reviewed, 409 were unexplained and 99 were explained after investigation. Seventeen deaths occurred in a sitting device, of which 10 were unexplained. There was no excess of premature infants dying. However, there was an excess of infants of less than 1 month of age found to have died in a sitting position in the unexplained death group. In addition, three infants who died in a sitting position had an increased risk of upper airway obstruction. Conclusion: Although very few deaths occurred in car seats, our results suggest that caution should be used when placing younger infants in car seats and similar sitting devices, whether the infants have been born prematurely or not. We also recommend that more attention be given to infants at increased risk of upper airway obstruction. Earlier reports have shown there is a risk of cardiorespiratory events and decreased oxygenation levels in premature infants being transported in car safety seats.1–5 These reports caused the American Academy of Pediatrics,6 7 as well as the Canadian Paediatric Society,8 to publish guidelines for the observation of premature infants in car seats before discharge home. In addition to spending some time in car seats, infants seem to spend a substantial amount of time in sitting devices. One study showed that infants could spend up to 16 h per day in sitting devices (mean value of 5.7 h, cohort of 187 infants studied).9 Questions have been raised as to the adverse effects of a prolonged sitting position for both premature infants and healthy term infants, with eventual deaths being a particular concern. Tonkin et al10 recently published their study of infants presenting with apparent life-threatening events while in car seats; most of the events did not occur during a car journey and only one of these infants was born prematurely. Bass and Bull11 mentioned several anecdotal reports of deaths attributed to sudden infant death syndrome (SIDS) of both term and preterm infants placed in car safety seats. Other publications,12 as well as guidelines from national organisations,6 11 have also cited anecdotal reports. Clearly, adverse events seem to be occurring in car seats, but the exact incidence of sudden deaths in car seats or other sitting devices is unknown. The aim of our study was twofold: to determine the incidence of sudden deaths occurring in a sitting position in a whole population, whether death occurs in a car seat or another sitting device; and to determine whether premature infants account for a disproportionate number of these deaths. We obtained data from the provincial coroner’s office on all deaths of children younger than 1 year of age that had occurred suddenly and unexpectedly between January 1991 and December 2000. In the province of Quebec, all sudden unexpected deaths must be reported to the coroner (usually a physician with special training) for investigation. The coroner’s investigation is informative regarding the circumstances surrounding the infant’s death, including where the baby was found and in what device (adult or infant bed, crib, bassinette, car seat, etc), as well as the medical history. The results of the coroner’s investigation are archived at the provincial coroner’s office, along with the autopsy report and copies of any other relevant reports. We conducted a thorough review of both the coroner’s reports and the available relevant reports. Since our study focused on sudden, unexpected deaths, we excluded from consideration all accidental deaths and deaths in hospitalised patients. We then obtained demographic data (especially regarding birth weight and gestational age, information not always available in the coroner’s report) on all infant deaths in the province from the Institut de la statistique du Québec (the provincial government statistics office). To link the two databases, we used the date of birth, date of death and place of residence. To classify the unexplained deaths, we used the following general definition of SIDS as proposed by Beckwith13 and recently agreed to by a group of forensic pathologists and paediatricians14: “SIDS is defined as the sudden unexpected death of an infant less than one year of age, with onset of the fatal episode apparently occurring during sleep, that remains unexplained after a thorough investigation, including performance of a complete autopsy and review of the circumstances of death and the clinical history”. Our study was approved by our institutional review board. Permission from the Commission d’Accès è l’Information du Québec was also obtained for access to the data from the provincial statistics office. Permission to review all cases of sudden infant death at the provincial coroner’s office was obtained from the chief coroner of the province. We used the median and interquartile range to describe the data. To compare data from the different groups, we employed the Mann Whitney rank sum test. To compare proportions between the different groups, we used χ2 analysis or the Fisher exact test with Yates correction for sample size, as indicated. Relative risk (RR) ratios were also computed, as indicated. We identified a total of 534 sudden unexpected deaths of a non-accidental nature in infants from birth to 1 year during the 10-year period of interest. Eight cases identified in the national database as SIDS or unexplained sudden death were not present in the coroner’s database; hence, no information is available as to the circumstances of these deaths. For six of these eight cases, there was no autopsy. Most instances had occurred in the earlier period of our study (1991–1994) and concerned infants living in the northern parts of the province (infants of Aboriginal or Inuit ethnicity). Information was available for the remaining 526 sudden and unexpected deaths as a coroner had conducted an investigation. For all these cases, we knew precisely the circumstances of death and whether or not the infants were in a sitting device or car seat, at home or on a car journey. Of these 526 cases, only six infants had not undergone an autopsy; they also lived in distant, remote areas of the province. None of these six infants died in a car seat or sitting device. After reviewing the circumstances of death of the remaining 520 infants, we clarified that 12 of these infants had been acutely and seriously sick and were being transported by their parents (n = 10) or by ambulance (n = 2) to hospital when the death occurred. These 12 cases were therefore not included in our general review. We were thus left with a total of 508 cases of infants unexpectedly found dead (0.60/1000 live births), 99 of which were “explained” deaths (19%) and 409 of which were “unexplained” (81%). Details of the ascertainment are given in fig 1. Figure 1 Ascertainment and classification. Data are expressed as the number of cases in each category. The numbers in parentheses refer to the number of infants found in a sitting position (seat group). Explained deaths included the following causes: cardiovascular (42%), infectious (23%), and metabolic, respiratory, gastro-intestinal and neurological (less than 5% each). Seventeen of the 508 deaths (3.3%) occurred in infants while in a sitting position (referred to hereafter as the “seat” group). Note that the group not dying in a sitting position is referred to as the “bed” group (even if some of the infants did not actually die in a bed, they were all lying down at the time of death). In the seat group, 10 deaths occurred while the infants were seated in a car seat, and eight of these happened during a car journey. The other seven infants were in various sitting arrangements at the time of death. The details of the circumstances of death for all 17 cases (10 unexplained and seven explained deaths) are given in table 1. The gestational age at birth was known precisely for 94% of the infants. In all cases of unknown gestational age (31 cases), the notes for past medical history mentioned a normal perinatal period, which may have meant that they were term babies. As well, the birth weight was within the range for a term baby, no infant was transferred to a special care nursery, and there was no mention of a prolonged stay in hospital. We therefore considered these infants as having been born at term. In this group of 31 infants without a precise gestational age, only one died in a car seat during a car journey. He was 6 months of age at the time of death (case 14 in table 1). The proportion of premature infants was quite similar in both groups (seat, 17.6% vs bed, 14.4%; NS). Seventy four infants were born prematurely, of whom three died in a sitting position. Two of these infant deaths were classified as SIDS: one was born at 33 weeks of gestation (postconceptional age (PCA) of 44 weeks, in a car seat during a 90-min car journey) and the other was born at 36 weeks (PCA of 54 weeks, in an infant seat, at home). The third infant died of a natural cause (born at 36 weeks, PCA of 56 weeks, congenital heart disease) in a car seat during a brief car journey. These three cases are presented (marked with an asterisk) in table 1. Data concerning age at death, including gestational and PCAs, are given in table 2. There was no significant difference between the seat and bed groups in terms of median chronological age or PCA at death, although both variables had lower values for infants dying in a sitting position in the unexplained death group. To further clarify the issue concerning age and maturity at birth, we examined the relative risk of the sitting position between infants born prematurely and those born at term, as well as between infants who had or had not reached 1 month of age (corrected for prematurity, ie PCA greater or less than 44 weeks). Three (4.05%) of 74 premature infants were in the seat group whereas 14 (3.23%) of 434 term infants were in the seat group. This would suggest an RR of 1.25 for the sitting position between premature and term infants. This finding of an RR greater than 1 has limited clinical significance. When the data are further divided between the explained and unexplained death groups, as shown in table 3, the RR of the sitting position increased to 1.68 in the unexplained death group. More importantly, if we consider age at death corrected for prematurity, a more significant difference emerges. Of a total of 64 infants who died at less than 1 month of age (corrected), six (9.4%) were in the seat group, whereas only 11 of the 444 infants older than 1 month (2.4%) were in the seat group, which represent an RR of 3.80 for the sitting position and is highly significant (p = 0.006). Again, if we divide the data between the explained and unexplained death groups (table 3), the RR of the sitting position is now 7.35 for the unexplained death group, while it is 0.93 for the explained death group. This clearly suggests a much higher risk for the sitting position for infants less than 1 month of age. The following cases demonstrate special characteristics that may have contributed to the death of the infants in a sitting position (the case numbers correspond to those in table 1). These characteristics include time in the sitting position and the presence of airway problems potentially predisposing to obstructive apnea. This 5-day-old infant had spent many hours in his car seat and was eventually found lifeless (the parents were shopping). One parent had always been present in the car. The autopsy did not reveal a cause of death. This 4-week-old infant (corrected age) was born at 33 weeks of gestation. He suffered from hyaline membrane disease and also had apnea and bradycardia, which had resolved upon discharge home. He had been at home for 4 weeks when he died in his car seat during a 90-min trip. The autopsy did not reveal a cause of death. This 29-day-old infant (term baby) with a cranio-facial anomaly had a suspected Pierre Robin sequence (he also had other mild malformations, as well as a scoliosis). The parents had visited the paediatrician because of symptoms of upper respiratory tract infection. The infant died in his car seat on the trip back home. The autopsy did not reveal a cause of death. This 26-day-old infant (born at 37 weeks of gestation) had occasional stridor and a past history of an apparent life-threatening event (in a sitting position). The night before his death, he fell asleep in the prone position on his father’s chest. He was found dead in sitting position, head flexed; he had slipped down on his father’s side. No cause of death was found at the autopsy. His identical twin, who had similar symptoms of stridor and was admitted for investigation, was found to have moderate to severe laryngomalacia and underwent epiglottoplasty. This 10-week-old infant (term baby) had a diagnosis of laryngomalacia. Because of the severity of his symptoms, plans had been made for a bronchoscopy to clarify the anatomy. He suddenly collapsed, after vomiting, while in his car seat during a journey of a few hours. When he was brought to hospital, major difficulties were encountered with the endotracheal intubation. He could not be resuscitated. No cause of death was found at the autopsy. In this paper, we present the first comprehensive data ever assembled on sudden infant deaths in a sitting position (deaths in car seats or similar devices). Our results reveal that such deaths are not particularly common and represent only 3% of the total number of sudden unexpected deaths in the first year of life. We also found that premature infants do not account for an excess number of the deaths in the sitting group. However, we did find an excess of infants of less than 1 month of age dying in a sitting position in the unexplained death group; time spent in the sitting position might be relevant. We undertook the 10-year review of data because of a perceived increased risk of death for premature infants in car seats.11 Of concern, too, were the studies of several premature infants who, while positioned in car seats, experienced prolonged episodes of low baseline oxygenation in addition to apnea, bradycardia and acute decreases in oxygenation levels.1 5 17 In addition, authors have reported more frequent episodes of low oxygenation occurring when an infant has spent a long time in a sitting position.2 17 We acknowledge the fact that there has been no randomised control trial evaluating the risk of positioning infants in car seats or sitting devices as pointed out in a recent Cochrane review.18 The authors of that review underlined the need to determine, in a population-based study, how commonly preterm infants experience serious adverse events in car safety seats. The fact that few premature infants have been found dead in car seats or similar devices suggests that there is no increased mortality for that group of infants. We acknowledge, however, that the relatively rare occurrence of such events means that we cannot draw these conclusions with much certainty from our data. Some premature infants experience episodes of oxygen desaturation, apnoea or bradycardia when seated in standard car safety seats. Health authorities in some countries, and the American Academy of Pediatrics, recommend that all preterm infants should be assessed for cardiorespiratory stability in their car seat before being discharged home. This is the first comprehensive review of infant deaths occurring in car safety devices and was extended to all deaths in a sitting position (ie, car seats not used during travelling and other sitting devices). Premature infants do not account for an excess number of deaths in car seats or other devices. Infants less than 1 month of age (corrected age) accounted for an increased proportion of cases of death in a sitting position as compared to older infants. Despite the apparent negative findings of our study concerning premature infants, two important points should be made. First, as already mentioned, the unexplained death group showed an excess of infants aged less than 1 month who died in a sitting position. The decision to study infants less than 1 month of age separately from older infants was based on the fact that in the first month of age the incidence of severe cardiorespiratory events (prolonged apnea, bradycardia and drops in oxygen levels) is at its highest and decreases significantly thereafter, whether infants are born prematurely or not.19 Second, two important contributing factors were present in the deaths of five of the infants in a sitting position: the long length of time the newborns had spent in a sitting position and the presence of increased risk of upper airway obstruction (laryngomalacia or cranio-facial anomaly). Moreover, four of these five infants were also less than 1 month of age at the time of death. In an elegant study, Tonkin et al20 have demonstrated that the decreased oxygenation levels of young infants placed in car seats are due to upper airway obstruction. These investigators showed that when an insert was placed in car seats that allowed the infant’s head to be maintained in a neutral position during sleep (thus avoiding upper airway obstruction), there was a decrease in the number and severity of episodes of lowered oxygenation. These facts are important, given our finding that three infants with an increased risk of upper airway obstruction died in a sitting position. It is also likely that the occurrence of airway obstruction is not limited to the car seat situation but would occur in any sitting device. A significant number of deaths in our study did not occur during a car journey. Indeed, deaths in car seats during a car journey only represent approximately half (47%) of the deaths in the sitting position. We know, with a reasonable degree of certainty, the approximate amount of time that infants who died during car journeys had spent in a sitting position. This information was not available for most infants found in sitting devices at home, although it is generally believed that infants spend a significant period of time in sitting devices. However, we were able to find only one study reporting the estimated times that infants less than 5 months old spend in infant seats.9 In this short report, some infants spent up to 16 hour per day in infant seats. We do not have a control group of healthy living infants in our study. However, we did include a group of infants who died suddenly and unexpectedly, and for whom a cause of death was found. Although this is not a true control group, it provides important information. There was no difference in the prevalence of death in the sitting position between the groups of explained and unexplained deaths. This may be due to the overall small number of deaths in the sitting position or might also reflect the fact that the sitting position contributed to the death in both groups. It is however important to highlight the fact that there was an excess of infants less than 1 month of age and that the significant relative risk was seen only in the unexplained death group. In summary, in this study we identified a small proportion of infants dying suddenly and unexpectedly of unknown causes in a sitting position. There was an excess of infants less than 1 month of age dying in the sitting position as compared to the group of infants who died when lying down. In addition, there were some predisposing important factors, such as the length of time in a sitting position and the presence of an increased risk of upper airway obstruction. There is no question that car safety devices have to be used in all cases when travelling with infants. The use of these safety devices has significantly decreased the morbidity and mortality of infants involved in car crashes.21 The information provided in this study should be considered for recommendations not only concerning travelling in car seats but also the use of infant seats.
. Premature infants in car seats. Pediatrics 1985;75(2):336–9.
. Risk of hypoventilation in premature infants in car seats. J Pediatr 1986;109(2):245–8.
. Ventilatory changes in convalescent infants positioned in car seats. J Pediatr 1989;115(3):451–5.
. Monitoring premature infants in car seats: implementing the American Academy of Pediatrics policy in a community hospital. Pediatrics 1993;91(6):1137–41.
. Predischarge car seat safety study for premature infants. Paediatr Child Health 1996;1(3):202–5. Committee on Injury and Poison Prevention and Committee on Fetus and Newborn. Safe transportation of premature infants. Pediatrics 1991;87(1):120–2. Committee on Injury and Poison Prevention and Committee on Fetus and Newborn. Safe transportation of premature and low birth weight infants. Pediatrics 1996;97(5):758–60. Canadian Paediatric Society, Fetus and Newborn Committee. Assessment of babies for car seat safety before hospital discharge. Paediatr Child Health 2000;5(1):53–6.
. Use of seating devices in infants too young to sit. Arch Pediatr Adolesc Med 1997;151(3):233–5.
. Apparently life threatening events in infant car safety seats. BMJ 2006;333(7580):1205–6.
. Oxygen desaturation in term infants in car safety seats. Pediatrics 2002;110(2 Pt 1):401–2.
. Potentially dangerous sleeping environments and accidental asphyxia in infancy and early-childhood. Arch Dis Child 1994;71;(6):497–500.
. Defining the sudden infant death syndrome. Arch Pediatr Adolesc Med 2003;157(3):286–90.
. 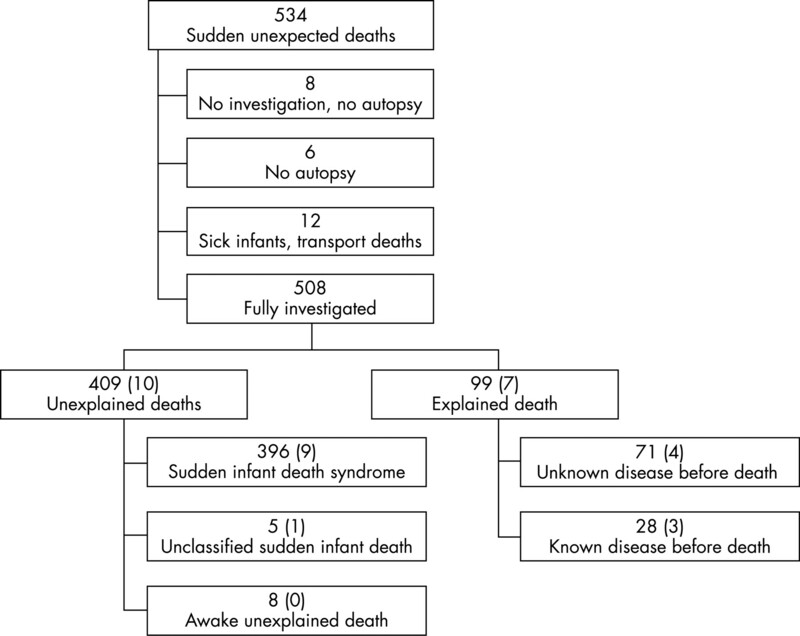 Sudden infant death syndrome and unclassified sudden infant deaths: a definitional and diagnostic approach. Pediatrics 2004;114(1):234–8.
. Sudden unexpected deaths in infancy: what are the causes? J Pediatr 1999;135(4):437–43.
. Histopathology atlas for the sudden infant death syndrome. Washington: Armed Forces Institute of Pathology, 1993.
. Respiratory instability of term and near-term healthy newborn infants in car safety seats. Pediatrics 2001;108(3):647–52.
. Pre-discharge “car seat challenge” for preventing morbidity and mortality in preterm infants. Cochrane Database Syst Rev 2006;(1):CD005386.
. Cardiorespiratory events recorded on home monitors - comparison of healthy infants with those at increased risk for SIDS. JAMA 2001;285(17):2199–207.
. Simple car seat insert to prevent upper airway narrowing in preterm infants: a pilot study. Pediatrics 2003;112(4):907–13. Committee on Injury and Poison Prevention. Selecting and using the most appropriate car safety seats for growing children: guidelines for counseling parents. Pediatrics 2002;109(3):550–3. Funding: This work was supported by the Réseau en santé respiratoire (Respiratory Health Network) of the Fonds de la recherche en santé du Québec.